Long before the beginnings of civilization, humans have been sacrificed and their flesh used to produce sacred foods and oils for use in religious rites. Originating with the sacred harvest of hallucinogenic mushrooms from the corpses of shamans and other holy men, these acts of ritual cannibalism and visionary intoxication are part of the history of all cultures, including Judeo-Christian ones, and provided a way to commune with the dead. These practices continued openly into the Dark Ages, when they were suppressed and adapted into the worship of saintly bones--or continued in secret by a few "heretical" sects, such as the Cathars and the Knights Templar. While little known today, these rites remain deeply embedded in the symbolism, theology, and sacraments of modern religion and bring a much more literal meaning to the church's "Holy Communion" or symbolic consumption of the body and blood of Christ. 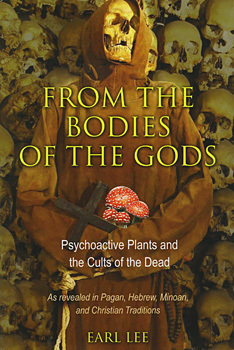 Documenting the sacrificial, cannibalistic, and psychoactive sacramental practices associated with the Cult of the Dead from the prehistoric Minoans on Crete to the ancient Egyptians and Hebrews and onward to early and medieval Christian sects, Earl Lee shows how these religious rites influenced the development of Western religion. In particular, he reveals how Christianity originated with Jesus's effort to restore the sacred rites of Moses, including the Marzeah, or Feast for the Dead. Examining the connections between these rites and the mysterious funeral of Father Sauniere in Rennes-le-Château, the author explains why the prehistoric Cult of the Dead has held such power over Western civilization, so much so that its echoes are still heard today in our literature, film, and arts. "From time to time, a book comes along that stops you in your tracks and stuns your mind. From the Bodies of the Gods is such a book. It will--and should--provoke intense discussion about some of the most fundamental underpinnings of Western religions." "An insightful analysis on early funeral rites and ethnomycology ... deepens our body of learning about the origins of the Christian faith and humanitiy's entheogenic history."